For Dr. Pablo Quintela, the decision to join an accountable care organization was an easy one. Orange Care Group, formed in 2014 under the Medicare Shared Savings Program, provides Quintela with support services to manage his small practice in Hollywood, Fla., through one of its four ACOs. It helps him correctly bill claims to the CMS, coordinate care for his Medicare population and prepare for the quality requirements of MACRA through educational sessions and tools. But perhaps the best part of the arrangement is that Quintela gets to keep his status as an independent-practice provider. "As a physician, when we partner with hospitals, they are always trying to lead the charge—they dictate what we are doing and what we cannot do," Quintela said. "It's better not to be burdened by the hospitals. We are trying to do what is best for the patient—not trying to worry about what is best for the hospital." As the healthcare landscape grows more complex in the push to value-based care, independent-practice providers like Quintela are increasingly looking to ACOs as a way to successfully adapt to payment reform while also keeping their autonomy. "It is really hard to stay independent in a world moving to risk," said Chris Dawe, vice president of Evolent Health, a technology firm that helps providers adopt value-based payment models. "Becoming part of a network of colleagues where you have the scale necessary to efficiently manage a population at risk and to share the expenses … it's an appealing pathway." As healthcare grows more complex and technology-reliant in the push toward value-based care, independent practice providers are looking to ACOs as a way to adapt to changes while also keeping their autonomy. For the first time ever, less than half of U.S. physicians—47.1%—are independent doctors, according to a report last May from the American Medical Association. A big reason for the shift is the rising costs associated with maintaining technology and other resources to comply with quality payment programs. But ACOs offer a way for independent practices to get the support they need to succeed in value-based payment programs like those established under MACRA. Many ACOs invest in technology, aggregate data and complete the reporting required for CMS programs on behalf of their doctors. "Without health information technology, you can't do this kind of collaborative care and move up in value-based purchasing, so it becomes critical to make these investments. That is where these large organizations can come in to help," said Dr. Mary Tilak, an Indiana-based independent-practice physician who's part of Community Healthcare Partners, a Medicare ACO operated by three-hospital Community Healthcare System. Orange Care Group has invested heavily in IT so its roughly 450 solo physicians—many of whom use different electronic health record systems—can easily understand and compare patient outcomes data. The ACO has partnered with local hospitals as well to share data so doctors are notified if their patients are admitted to the emergency room and likely require follow-up care. "We learn how we are performing and where we can do better," Quintela said. "That wasn't available before." Physicians in a Medicare Track 1 ACO are even given a pass on some of the reporting required under the Merit-based Incentive Payment System. For example, they don't have to report costs because the CMS is already evaluating this metric as part of the providers' participation in the Medicare Shared Savings Program. "We take care of (the reporting requirements) for them, and it helps them avoid a penalty," said Dr. Ronald Kimmel, chief medical officer of St. Francis Healthcare Partners, a Medicare ACO based in Hartford, Conn. Approximately 60% of the physicians who are part of St. Francis Healthcare Partners are independent-about 460-while the others are employed by Trinity Health. Kimmel said the arrangement allows the ACO to expand its patient base. "The more covered lives you have and can work with, the better your chances of success." A large part of the ACO's work is simply helping the independent doctors better understand and prepare for the complexities of such value-based payment programs as MACRA. "There is a level of sophistication we have to bring providers up to speed on," said Dr. Alan Kumar, chief information officer of Community Healthcare Partners. Community joined Track 1+ this year after it explained to its 635 providers, including physicians, nurse practitioners and physician assistants, how they can benefit from a downside risk contract. Medicare ACOs in downside risk tracks qualify as an advanced alternative payment model under MACRA, and therefore are eligible for a 5% bonus for all their doctors. "We don't think we would've gotten as much traction (among doctors for Track 1+) if it hadn't qualified us as an advanced APM," Kumar said. Its physicians will not be on the hook if the ACO incurs losses; instead Community Healthcare Partners will take the hit, he said. A large focus for ACOs is to prepare physicians to transition to taking on downside risk contracts. "We know the market is going toward risk," said Lissette Exposito, CEO of Orange Care Group. "All of the support we are giving them is to ready them to take on risk." Orange Care Group has one ACO that's part of Track 3, a downside risk contract under the Medicare Shared Savings Program. Orange Care didn't take its decision lightly to venture into Track 3. Leaders reviewed performance data over a four-year period and identified 90 physicians they thought were ready to join the track last year. "We had a lot of confidence in those providers to move into the risk space," said Frank Exposito, Orange Care Group's chief operating officer. Independent doctors aren't the only ones who benefit from joining ACOs. 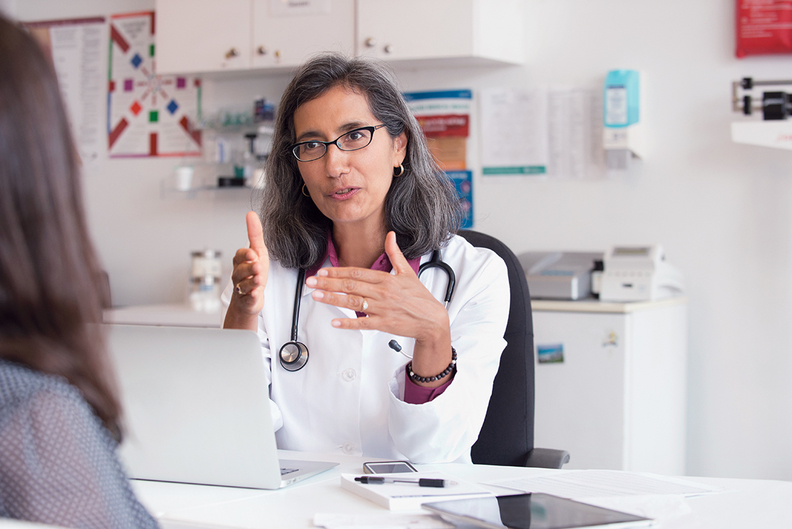 Health systems and hospitals find advantages participating in ACOs with solo doctors. According to the CMS, 58% of the 2018 Medicare ACOs include both physicians and hospitals. In these ACOs, health systems and hospitals are able to gain a patient population without having to directly employ physicians in the local community, said Matthew Amodeo, a partner at law firm Drinker Biddle who works on ACO contracting. Independent doctors will refer patients to the local hospital or health system if they are part of the same ACO because they are working together to care for the same population. "It's a strategy play," Amodeo said. It's also simply unrealistic for a hospital or health system to employ all the doctors in the community, so it's advantageous to have them as partners. Brian Tabor, president of the Indiana Hospital Association, which represents more than 170 hospitals, said he isn't surprised hospitals and health systems are pursuing ACO arrangements with independent providers. "Scale is an issue; you have MACRA, pressures from commercial payers, downward pressure on costs—all of those things are making it more difficult for everyone involved," he said. "It can be really difficult for even a midsized integrated health system. You really need to involve others in the continuum of care to be successful; they can learn from each other." Kumar at Community Healthcare Partners echoed that sentiment, saying a significant amount of the ACO's success is driven by "the hard work of independent practitioners." 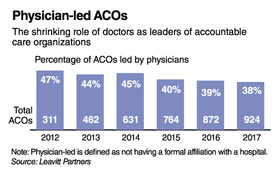 About 53%—or 339—of the providers in the ACO are independent. "We are not a health system dominated by employed physicians," Kumar said. "To engage those providers who don't want to become employed and stay autonomous, that is why we went down this path, to provide an avenue to remain independent. They drive a lot of admissions, so we wanted to make sure to collaborate with them."